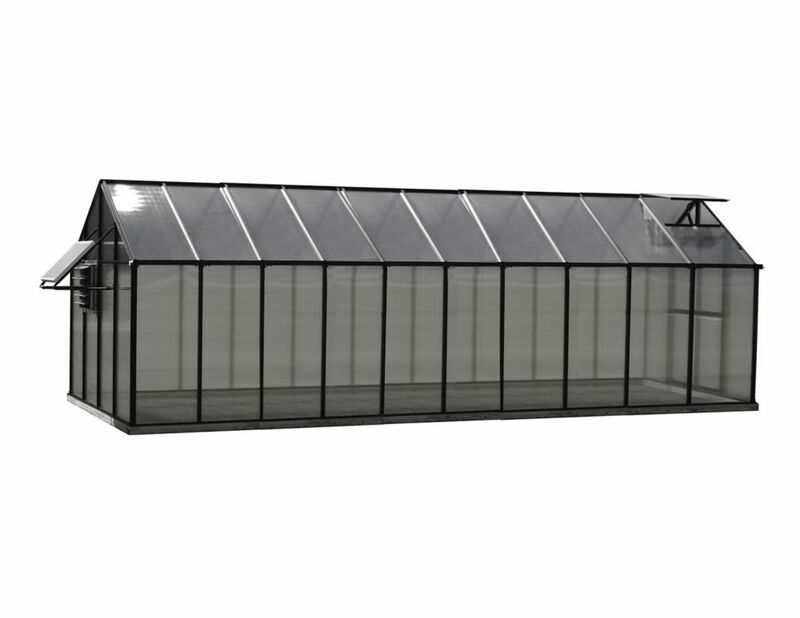 Greenhouse 8 ft. X 20 ft. Black Greenhouse - Mojave Edition is rated 4.0 out of 5 by 5. Rated 5 out of 5 by Dylan from Great Product This greenhouse wasn’t very difficult to assemble. It looks great in my yard and I am very pleased with my purchase. Rated 5 out of 5 by GrowGreen from I spent a lot of time comparing and choosing the right greenhouse for my needs and I'm very happy... I spent a lot of time comparing and choosing the right greenhouse for my needs and I'm very happy with my purchase. You will be very happy with the quality of this product. I'm looking forward to growing vegetables and having fresh tomatoes during the winter. Rated 5 out of 5 by DK from Product was very easy to setup and start using. Very good quality and craftmanship. Shipped on t... Product was very easy to setup and start using. Very good quality and craftmanship. Shipped on time and had no damage upon receipt. We have already started using this and are very happy with the product. Would highly recommend! Rated 4 out of 5 by Wally from Very pleased with greenhouse, we’ve had it for a year and it surveyed the winter with easy , my w... Very pleased with greenhouse, we’ve had it for a year and it surveyed the winter with easy , my wife has the green thumb and couldn’t be happier. Rated 1 out of 5 by Disappointed from After a lot of research we got this greenhouse in october 2016. First of all, because two of the... After a lot of research we got this greenhouse in october 2016. First of all, because two of the shorter aluminum bars were missing, we opted to cut one of the longer ones in order to progress with the building. Although we got the missing piece directly from River Stone, it did delay finishing the project. The final product works and looks nice but there were several problems along the way. Many of the aluminum bars were not cut precisely, therefore the final fit is not perfect. And it took a lot longer to assemble, than advertised. How good it looks in the pictures, how well it is made ( in the US) and how easy it is to assemble are ALL inaccurate compared to the advertisement of this product.